Impact crusher is widely used in the fields of mining, construction, high way, railway, and airport etc. which is greatly praised by customer for its crushing performance. During working process, the operator should know the failure condition and how to solve it. Please follow the technician from Luoyang Dahua to know the usage attentions of impact crusher. 1、If the temperature of the bearing is quite high, it means the bearing lacking of lubricant and needs to refill the lubricant immediately. However, if the volume of the lubricant is over used, the bearing will also rise temperature. Please check the lubricant level before adding to prevent bearing damage. Please timely replace bearing and tighten the upper cover by good adjustment of the bolt. 2、If the impact crusher has the phenomenon of abnormal shaking, it may caused by dropping oversize material. Please check the size of the feeding material. 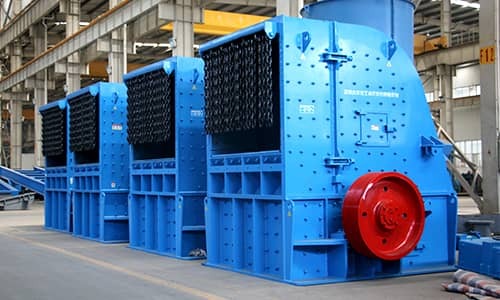 If the components of the jaw crusher are unevenly worn out, which means the impact hammer head needs to be replaced, or the running of the motor is not in balance and needs adjustment. If the foundation is not properly settled, please check the fixing bolts and tighten them. 3、If the belt of the impact crusher is overturned that means the belt is worn out and need to be replaced. Due to the problem of belt settlement, we must adjust the belt to the same level. The weight of the V-belt should pay great attentions. 4、If the granularity of the final product is oversize, which means the hammer head has worn out. Please turn the hammer head upside down or replace it. Or the space between the hammer hand the impact plate is too big. Generally, we adjust the space to 15mm - 20mm. Material with large granularity may also influence the discharging speed.